Per person for driving F1 car, tuition and transfers. Per person for non-driver (spectator) consists of transfer & lunch on the track. 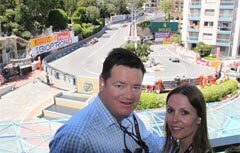 Many thanks Kenneth for an absolutely fantastic time over the Monaco weekend. You totally delivered! Short of giving us orange boiler suits and brooms, you couldn't have put us closer to the action or in a more perfect spot for qualifying and the race. And the Red Bull pit, Energy Centre and JBT yacht experience was a day like no other. So perfect was it all, that I started to wonder if you even controlled the weather.